Unidoor 40-inch to 41-inch x 72-inch Semi-Framed Hinged Shower Door in Brushed Nickel with Shelves is rated 4.4 out of 5 by 7. Rated 5 out of 5 by Firemop from Door is high quality looks great operates great... take care... Door is high quality looks great operates great... take care to follow directions , make accurate measurements for layout and you won’t be disappointed!!!! Rated 5 out of 5 by Steve from Dreamline doors more than met my expectations. These doors are... Dreamline doors more than met my expectations. These doors are absolutely beautiful. The quality is well worth the cost which I felt was resonable . Their customer service team is also excellent. 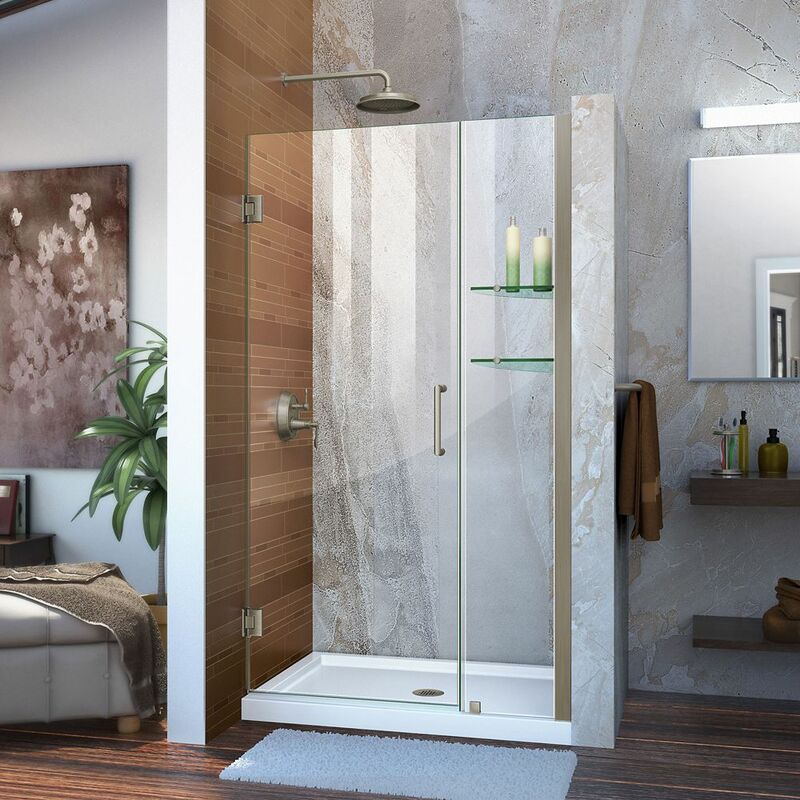 I spent a lot of time researching shower doors and felt Dreamline best in class for quality vs cost. Rated 5 out of 5 by DJB from For the money this shower door is an excellent choice. It took me about 3 hours to install and i... For the money this shower door is an excellent choice. It took me about 3 hours to install and it takes two people. I had some difficulties drilling through the ceramic tile so I drilled new holes in the wall profile piece so I could go through grout lines. I wish the hinge screws were a torques head instead of a Phillips head. This would make the assembly much easier. I stripped out two of the hinge screws but luckily the kit came with extras. I used the hinge shims as a template when drilling the holes. Finally, I wish the inside two holes of the hinges were outside the profile of the hinge so the glass wouldn't need to be removed. All in all this is a super nice door. Rated 4 out of 5 by KRW from Looks great. Easy to assemble.... Looks great. Easy to assemble. Rated 4 out of 5 by Cleanerer from Good product compared to other brands. Fed Ex botched the delivery to the Home Depot store and then lost box #5 of 5. Home Depot made it right by delivering the door and then crediting me for my time lost going to the store and not getting the product. The door is good quality and heavy, so make sure you're ready for this. It looks really nice once installed and compliments the rest of the bathroom.